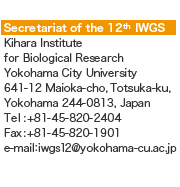 In conjunction with the forthcoming 12th International Wheat Genetics Symposium at Yokohama, Japan, we would like to hold a satellite meeting in Kyoto, which is entitled "Triticeae Cytogenetics: Past, Present and Future". The meeting is scheduled on September 15th and 16th, and the venue is on the campus of Kyoto University , where Professors Kihara, Tsunewaki, and Endo have made great contributions to wheat cytogentics. As the title stands for, we would like to focus on chromosome sciences in Triticeae. All researchers with interest in cytogentics in wheat, rye, barley and other related species are welcome. We will be most happy to have a good opportunity for discussion on Triticeae Cytogenetics in the relaxed atmosphere of an ancient city Kyoto. The admission for the meeting will be free, but we will ask the participants to cover their transportation, meals and accommodations. For more information, please visit our web page by clicking the banner.